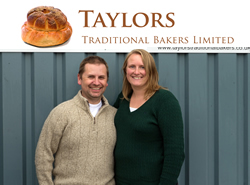 Taylors was established in the village of South Brewham in 1945 and is now in its third generation. 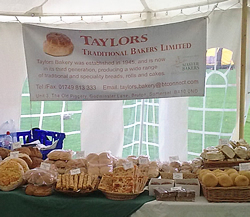 All our products are produced to the highest standards in our own bakery by experienced craft bakers. The majority of our breads are still handmade in the traditional way and we produce a wide variety of products including traditional and speciality breads, rolls and buns. As well as going to markets, we also supply a variety of local businesses via our delivery vans. This entry was posted in Axbridge, Bread and baked goods, Burnham on Sea, Keynsham, SFM@Frome Independent. Bookmark the permalink. Both comments and trackbacks are currently closed.